Richards Dog Harness Coat Company is a family run business in Troy, Michigan and has produced unique Harness Coat™ dog coats since 2004. They produce the finest quality harness dog coats for all breeds of dogs. Richards Dog Harness Coat line includes winter warmth dog coats, dog rain coats, medical spa cooling dog coats, and farm, field sports and hunting dog coats. Richards Dog Harness Coat Company trademarked its exclusive Harness Coat™ and built a distinguished reputation for the finest dog coats on the market using high quality fabrics. The harness coat is just what it says – a protective harness and coat integrated together. Simple and easy to use. Richard’s Dog Harness Coat Co., LLC did a lot of research to ensure the safety and comfort for dogs. There are many dog coats, dog sweaters, designer dog coats, and pet clothes on the market designed to provide warmth and fashion but they fail to work appropriately with a dog harness and they can be cumbersome to use. The Richards Dog Harness Coat design protects against cool or inclement weather while adding the benefits of a pet friendly harness. You won’t find a dog coat that is easier to use. With the Harness Coat, two simple American-made clips and the dog is ready to go. 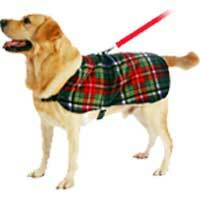 Our Harness Dog Coat incorporates sturdy clip fasteners. Hook and loop fasteners (like Velcro®) are not used as they may sometimes become worn and then fail. The use of the Harness Dog Coat provides control of your pet without pressure on the throat. The Harness Dog Coat can be used with or without your favorite dog collar or choker, and fit nicely over sweaters. The Harness Dog Coat is completely open on the underside. The unique product design avoids rubbing or chaffing and is warm, lightweight and comfortable for the dog while providing a ring for quick hook up and release of a leash by the caregiver. Shop Richards Premium Dog Harness Coats Today!